A popular fifteen-year-old girl is strangled to death at a school camp on Auckland's west coast. The posing of the body suggests a sexual motive. Nick Knight, a week into his role as a newly promoted Detective Sergeant, is tasked with the critical job of leading the Suspects Team. Nick - who turned his back on a lucrative career as a lawyer - is well-versed at dealing with the dark sides of human nature. With no shortage of suspects, he sets out on the trail of the murderer, grappling his own personal demons along the way. But are things really as they seem? The novel opens with Nick Knight, new to the role of Supervisor in the West Auckland Police’s Criminal Investigation Branch, being advised that 15 year old Natasha Johnson has been found dead in the grounds where her school class has been camping. Knight and his team are soon on the way to the scene and down to business with the myriad tasks requiring completion all being attended to with a minimum of fuss and appropriate professionalism. Being a major case a lot of police are assigned to it and Knight’s team is responsible for one component: suspects. Other parts of the larger squad are responsible for evidence, witnesses and so on. I found it interesting to learn that this is how things are divided up in reality, at least in this part of New Zealand. So we spend most time learning about who might have killed Natasha. One of the teachers who was chaperoning the school camp? A fellow student? A suspicious outsider known to lurk in the area and ‘pleasure himself’ at will? The sometimes frustrating grunt work needed to rule people out of (or into) suspicion is well depicted and Wyatt also does a great job of exposing the reality of how investigations like this have to force their way into the private lives of many people, most of whom will be proven to have nothing to do with the crime but still have their lives turned upside down. THE STUDENT BODY is squarely in the police procedural quadrant of the crime genre spectrum. Not only is its central character an active policeman but the story is told in the first-person perspective. The upside to this is that there is an authentic, quite immersive feel to the investigative elements of the novel: the reader really does get some sense of what it must be like to be involved with a fast-moving, high profile case. The pressure from everywhere – superior officers, victim’s family, the media – is quite palpable and Knight has to work hard to keep his own and his team’s morale up at times. The other consequence of Wyatt’s narrative choices is that Knight’s view of events is naturally limited – we can never know what’s going on with other team members or those affected by Natasha’s death unless Knight is present or being told first-hand. I did feel a few times like I was missing out on parts of the story – such as how Natasha’s parents and best friend were dealing with the events – but can appreciate that wasn’t the story Wyatt has chosen to tell here (I’m just really nosy, I want to know everything). Nick Knight is pretty well fleshed out as a character though for me this meant he was not always the nicest person to be around. Although he takes his job seriously and is, mostly, very professional he can also be quite laddish and towards the end of the novel displays a willingness to commit violence that I found a bit disturbing. Still he is funny and caring at times too. I guess like most of us Nick isn’t perfect so it is a very realistic depiction. There really isn’t space given the book’s length and style to get to know any of the other characters very well and I would have appreciated an alternative voice or wider perspective at times but that’s a minor quibble. I’m sure Nick Knight will have many fans. 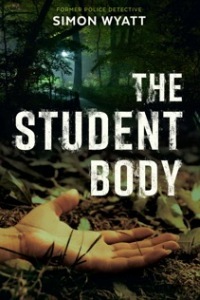 Overall THE STUDENT BODY is a solid procedural with an authentic feel and will be enjoyed by those who like getting into the nitty gritty of a case unfolding. It offers a good sense of its New Zealand setting, giving me the itch to visit Piha beach for example, and the resolution is a genuine action-packed, nail-biter. Bernadette Bean was simply one of the best online crime reviewers. She is a former Ned Kelly Awards judge, founder of the terrific Reactions to Reading and Fair Dinkum Crime websites, both wonderful resources, and a long-time supporter of libraries, Australian crime writers, and women's writers. You can read more about her in this tribute piece I wrote for the Australian Crime Writers website. Bernadette passed away suddenly last month. In the past Bernadette and I have republished some of each other's reviews on our respective websites. I hadn't previously published this review of hers as someone else had already reviewed THE STUDENT BODY for Crime Watch. But it is a great example of her exceptional, insightful, detailed reviews, and given it was her final review of a New Zealand crime novel, I feel it's appropriate to republish it here today as a tribute to Bernadette.